Boudhanath Stupa, Pashupatinath Temple, Swyambhunath Stupa, Kathmandu durbar squire, Bhaktapur Durbar, Nagarkot and Pokhara. 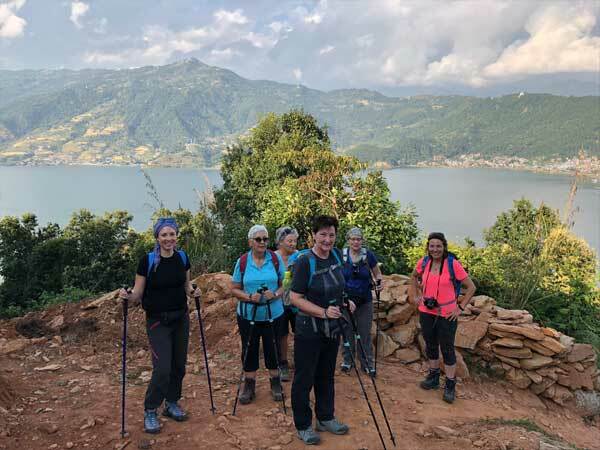 Kathmandu, Nagarkot hill and Pokhara tour in Nepal 5 nights 6 days Tour is a mishmash of walking around fascinating cultural heritages and witnessing the natural charisma of Nepal. You will get an awe-inspiring chance to explore historical and cultural places enlisted in UNESCO World Heritage list. Along with the art and architecture carved in wood, metals or stones and walking around old palaces, temples, etc, the haunting views of breathtaking Himalaya ranges as well as sunrise view over the ranges will be memorable forever. Matterhorn Treks will take you sightseeing around Swoyambhunath set at the hillock which bestows the sight of Kathmandu Valley from the top. Visiting Boudhanath, the largest stupa of Tibetan Buddhist Culture is also a breathtaking experience. The holiest place for Hindus- Pashupatinath temple devoted to Lord Shiva set next to holy Bagmati River also is the highlight of the tour. Exploring Kathmandu Durbar Square and visiting different holy and historically important set will totally enthrall you. Sightseeing in Some of landmarks that are the World Heritage Sites of Kathmandu the sacred Hindu temple of Pashupati Nath, the famous Buddhists shrine (Bouddha Nath). Overnight at Hotel. After Breakfast we drive to Bhaktapur and you will explore Bhaktapur City. Bhaktapur is an ancient newar city located in the east corner of the Kathmandu Valley, approximately 13 km (8 miles) from the Kathmandu Valley. Also known as an open museum, it is home to some of the best preserved historical monuments including palaces, courtyards, temples, pagodas, monuments, craftwork, hand-crafted peacock windows, etc, reflecting mostly Hinduism. It has two of the seven monument zones within the Kathmandu Valley listed as a World Heritage Site by UNESCO. There in also a rich concentration of culture and tradition among the Newars of Bhaktapur. They have their own festivals, music and dances. The entire city is full of historical masterpieces. Bhaktapur is also famous for it’s marvellous crafts including pottery, weavery, thanka and masks and is popular for its mask dances that reflect the lives of different Gods and deities. The name Bhaktapur literally translates to “City of Devotees”, thus one can expect to find a multitude of religious places, monuments and events in Bhaktapur. The place is renowned as the city of Gods After Lunch we will leave for Nagarkot for Sunset Views. Nagarkot (2195m) lying 32 km north east of Kathmandu. During Nagarkot hill station tour you will see panoramic views of various mountain from Nagarkot. Likewise, you can hold the amazing Sunset view over the huge Himalaya range from Dhaulagiri in the west to Kanchenjunga in the east. One can view better scenes especially during November, December and March April. Overnight at Hotel. Today you will have chance to see beautiful sunrise views from Nagarkot, if the weather clear then you will have chance to see several white and clean mountain from Nagarkot. After breakfast then we will drive to airport for Pokhara flight. From Nagarkot takes about 1 hour to airport and from airport just 20 minutes fly to Pokhara or drive Pokhara from Luxury car which takes approximately 7 hours (If you love to go by driving). Pokhara actually is the second biggest city of Nepal situated to the western direction of Kathmandu. Overnight at hotel. Early in the morning you will drive to Sarangkot for Sunrise views from Sarangkot ge get a view of Mt. Annapuran region. From Sarangkot hill station we can see you can see a panoramic sweep of Himalayan peaks, from Dhaulagiri (8167m) in the west to the perfect pyramid of Machhapuchhare (6997m), the tent-like peak of Annapurna II (7937m) to Lamjung (6983m) in the east. After you we came back from Sarangkot you will have breakfast. After breakfast our sightseeing tour will start, we will visit Bindhayabasini temple, Buddhist Monastery, International Mountain museum, Devis Fall, Tibetan refugee camp, Peace stupa, boating at Fewa Lake. Making a trip to Tal Barahi temple is one of the attractions situated in the center of Fewa Lake and experience settings and lush wooded area just beyond the southerntip of the lake is a splendor. You can walk around the area in the evening. Overnight at hotel. Morning we will drive by private bus or Jeep the scenic countryside and en route will stop for lunch. It takes 7 hours back to Kathmandu. On arrival at Kathmandu guide will transfer to the hotel and rest of the day relax or explore the surrounding areas. Overnight at hotel.